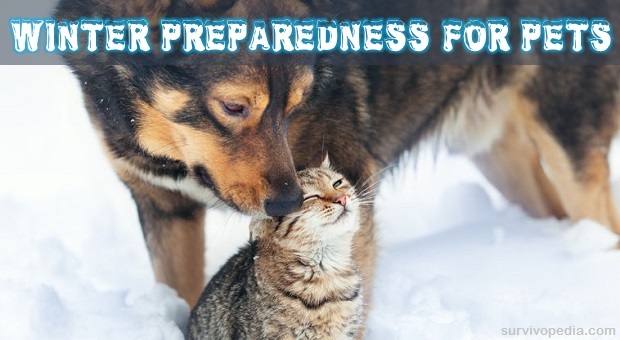 When prepping yourself for winter – remember the “other” members of your family! It’s that time of year again – the time when everything gets cold, windy and wet. For us, it’s not so bad because we can bundle up with warm boots, coats and gloves. For our pets, though, winter is rough. There are several steps that we as pet owners can take to make it a bit easier on them, though. We’re going to give some tips to help keep both your indoor and outdoor pets warm, dry and comfy. If your pet lives outside, you need to make sure that he has a warm, wind-resistant shelter that is plenty big enough for him to get in to. Put warm straw or hay in it and do what you can to seal cracks. If it gets too cold – below freezing especially – consider bringing your dog or cat inside.